Comics Make Me Happy! : The Trouble With Telepathy? I've been stewing on this for some time, and a recent discussion over at The Idol-Head of Diabolu brought it back to mind. Now, one thing that seems to be an instant plot hole for J'onn (and arguably any character) is telepathy. J'onn has always suffered from a fuzzily-defined powerset, and this isn't limited to his mental powers. Throughout his history, we've seen the Manhunter from Mars do everything from read thoughts to control minds to erase memories. In 52: World War III he took Black Adam down by barraging him with memories of the tragedy of Mars. Dammit, J'onn. Where were you when the Red Sox won the Series?! In the next issue, Detective #227, he reads a criminal's mind, but then he lays off the telepathy for a while and relies on "Martian superhearing" and his other powers to get information on crooks. Later on his adventures mostly revolve around his not trying to give away his secret identity and the telepathy seems to have fallen by the wayside. The plot revolves around some crooks who fool J'onn into thinking he's no longer affected by fire so that they can later set a trap for him. He could easily have read that man's thoughts to determine a.) he's a crook, and b.) it's not really a match. However, he didn't really use telepathy after that. J'onn seemed to have abandoned his mental powers, the problems with telepathy fell to the wayside, and J'onn resorted to other means to solve crime. In Detective #299, J'onn didn't even bother using his mental powers to determine the identity of a spy; he just went undercover. Was this abandoning of telepathy a conscious change by writer Jack Miller? Telepathy is a huge plot killer which opens up all sorts of plot holes. Why do any detective work if you can just read minds? (Okay, I guess maybe because telepathy won't stand up in a grand jury because it's hearsay...) In Detective #227, J'onn knows a criminal mastermind is guilty from reading his mind, but can't prove it, so he drives the guy crazy until he confesses. I suppose he could've kept on pulling off stunts like that, but a trick like that can only work just so many times, and it might make our hero look a little cruel after a while. I'm almost wondering if the Silver Age writers wanted to abandon the telepathy entirely. In his early appearances, when his character was being still being developed, J'onn had all sorts of crazy powers, many of which were whittled away. Maybe the telepathy should've gone away, too. It just leads to all sorts of story problems. What about simple mind-reading? J'onn tries not to "invade" the minds of others. Since he's an upright guy, that makes sense to me. But in the Silver Age, he didn't mind resorting to a little deviousness to get the job done. I think the whole "ethics" of mind-reading was tacked on later to depower him a bit. Basically, if you're going to write a chracter with telepathy (or magic), you need some clear-cut rules. Maybe he can only read what someone's currently thinking about. Maybe he has to touch them. Maybe he can't read insane minds. Maybe using telepathy exhausts him and takes him out of battle for a while. Maybe there's the risk of feedback which can shut his mind down. There's got to be limits on power, or you don't have an even battle, and hence, no story. And putting rules (though not necessarily limits) on J'onn's power will get rid of the need for silly ad-hoc plot devices like "telepathic locks" and whatnot. Either that, or ditch the telepathy entirely. 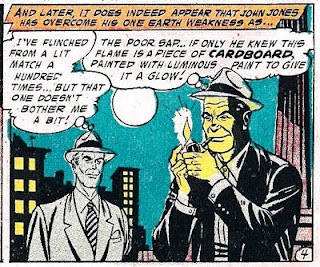 J'Onn's mental powers were abandoned very early on, and forgotten until Gerry Conway brought them back near the end of his Detroit-era Justice League run. As I recall, they were limited to surface level mind reading. J.M. DeMatteis greatly expanded these powers after the 1988 solo mini-series, including the use of Mayavana to defeat Despero around 1990. Following DeMatteis, the telepathy was used sporadically, and usually as a communication tool, until Waid & Nicieza's A Midsummer's Nightmare mini-series in 1996. Waid and later Morrison ramped up the mental powers considerably, turning J'Onn into a lighter version of Professor X . Thanks for answering my questions, Frank. I knew you could straighten out whether or not telepathy was abandoned in Tec. You must have a photographic memory. I'm glad that Mayavana can only be used once--there's an example of telepathic powers that I think was handled very well. The more I think about it, the more I'd rather see no or very weak telepathy....hmm. I've been reading too much Showcase. Come to think of it, there was no telepathy in American Secrets, was there? I think there was some vague empathic form of telepathy in American Secrets, but that's more opinion than verifiable fact. I like J'Onn having low level communicative telepathy, where he can invade a mind at its best/worst, but not without a fight. I don't think it should be tactile, but he shouldn't be turning brains off or probing anyone at will, either. In working on the Captain Comet Bantam Blog, I made the relatively obvious discovery that Adam Blake was the ideal Martian Manhunter of the versus thread/more power mindset. Knowing this, I'm inclined to retreat from a number of the modern interpretations of J'Onn's powers and let the Man of Destiny serve as the Ultimate Super-hero Telepath. By the way, I went all the way back to the earliest blog posts here with comments. I didn't want you thinking I neglected a month's work, after all. Just wrote a post involving J'onn and his telepathy...synchronicity? I like J'onn having low level communicative telepathy, where he can invade a mind at its best/worst, but not without a fight. 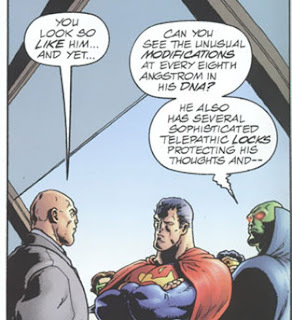 > Yeah, this is the perfect level of telepathy for J'onn. Although, maybe he should be able to expand those powers but not without risk (e.g. losing control or damage to his mind or whatever). Liss, remember that team that you proposed: The question, Doctor Midnite, Blue Beetle, and J'onn? You were wondering this exact thing in terms of telepathy being a potential plot-killer. Hey, how would J'onn handle a world where virtually all thoughts were lies that were indistinguishable from truth? "I'm inclined to retreat from a number of the modern interpretations of J'Onn's powers and let the Man of Destiny serve as the Ultimate Super-hero Telepath." Interesting. It makes sense, though--you don't need two telepaths. Plus Capt. Atom's got telekinesis and warping, right? It makes sense for him to have telepathy. I'm going back to all those earlier posts and replying! I really do appreciate the comments. Yes, I remember my DC FF. I don't remember what I called it, though!